Folks, that quote came from an election judge at the Baltimore County Board of Elections. Troubling, isn’t it? Shouldn’t WE be the ones who determine the intent of our vote, rather than leaving that up to someone else? What is more disconcerting is that, as stated in our previous article on the subject, this particular election official seemingly confirms that the current system is convoluted at best. That leaves us to question whether our votes are actually counted properly. Here is what we believe to be the problem with the vote count, as relayed to us by the BC election official. Obviously, the election official was speaking metaphorically to describe the number of ways in which the voter may cast a ballot, but his words do provide some insight on the impact of a single vote … and how it is tabulated. We asked if there was any precedent regarding what happened in this primary election, and the response was rather ambiguous (at least to us). We were assured that there was no partisanship in the counting of the votes, and we were reminded that each election official took an oath to conduct a fair and accurate count. However, according to the BC election judge, they have wide leeway in determining what is a vote and how it is to be counted. The election official said they are guided by Maryland law as established under COMAR, Section 33.03.02. After reading this section, one has to ask if our vote does actually count based on whether the machines that tabulate the votes have the ability to discern what is, and what is not, a vote. 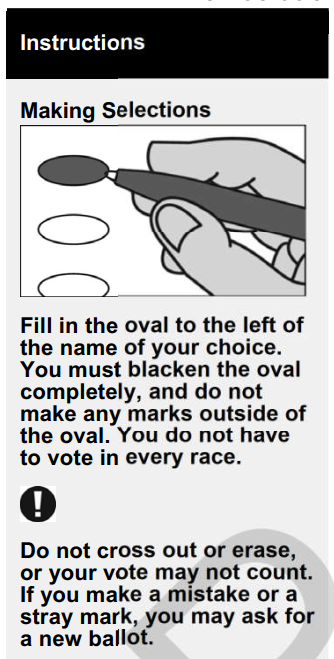 Has anyone who voted been given any instructions other than receiving a sample ballot prior to the election or reading the instructions below? The answer to that question would be an obvious No! We asked a simple question regarding the filling in of the vowel “O,” and we received an unbelievable response regarding how certain ballots were tabulated by election officials. We asked if coloring in the vowel constituted a vote for the candidate whose name contained the vowel. The answer was yes. 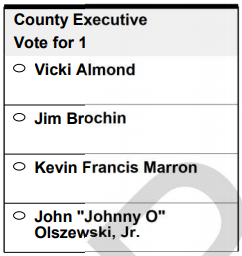 Obviously, we knew the answer before we asked the question, since officials had already confirmed that they were counting a colored-in “O” next to the name of “Johnny O” Olzewski, Jr. as a vote for him. If you look at the ballot below, observe how many other names containing the letter O you see? Additionally, if anyone can find a sample ballot or instructions stating that filling in a particular vowel in a candidates name counts as a vote, then please bring it to our attention. Technically, there are not a million ways in which to cast a valid vote. 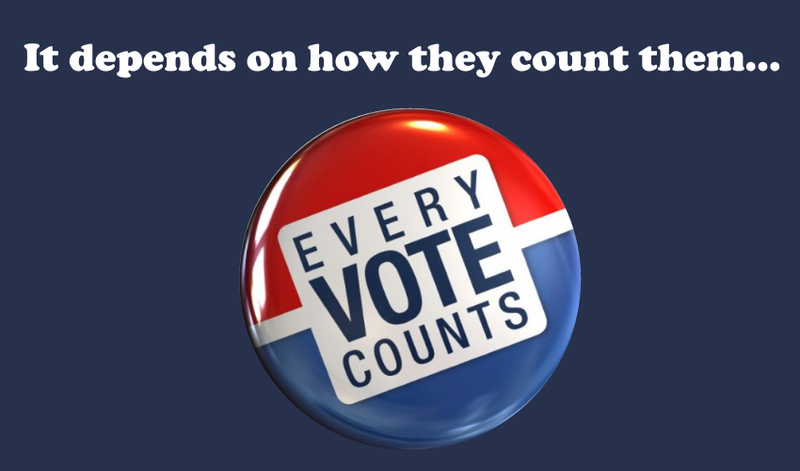 And we can all be certain that the voting machines will only capture ovals that are colored in by the voter, not vowels in the candidate’s name. Those will be rejected by the machine. So why did the humans count those votes? 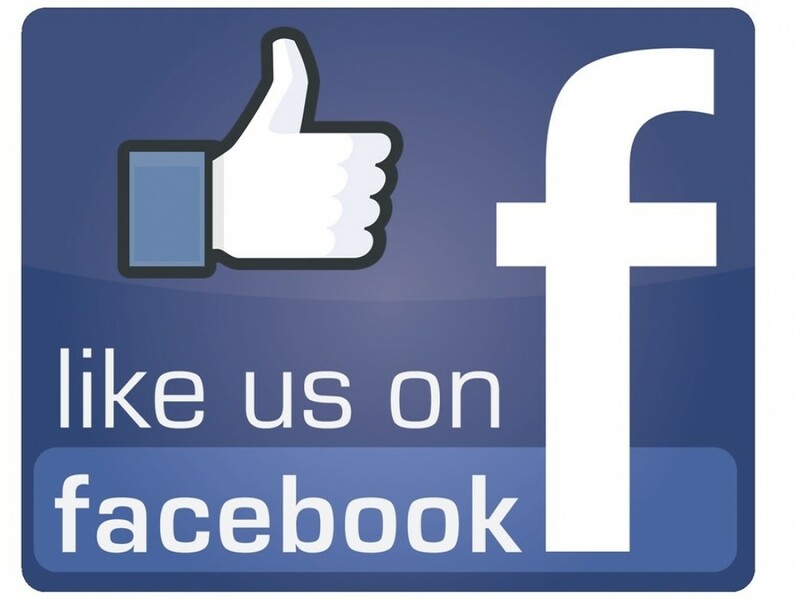 We are guessing that we will never know the real truth. The election official said they were guided by the below documents on how to count as what we termed as “chicken scratching marks” as votes. Again, if you can find the section that states it is allowable to fill in a vowel instead of an oval, please let us know. It should also be noted that the election official stated that they were consistent in counting such votes. For example, he said a vote would be cast for councilman candidate David Rader if a voter filled in the D in Mr. Rader’s first name. We just cannot see how COMAR Section 33.08.02 allows for voters to fill in the “O” in the name “Johnny O” and have that considered to be a vote for Mr. Olszewski, Jr. The BC election official said there were numerous ballots that contained that issue. Just how many of those votes were counted incorrectly? Again, we may never know the truth. What if the voters who colored in the “O” actually were indicating a “zero” vote for candidate Olszewski? How many people may have thought they were voting for Johnny O’s father, who was a 16-year Baltimore County Councilman? Let’s look at the numbers to understand the gravity of the situation. A total of 17 votes separated the two candidates. According to the election official, three people filled in the “O” on their ballots, which leaves a remainder of 14 votes. The official said there were also absentee ballots that contained a similar type of mark that were counted in favor of candidate Olszewski, Jr.
And nobody finds this to be odd? When pressed further, the official confirmed that the machines would have rejected all of the votes that did not properly fill in the oval shape as instructed. What is perplexing to us, and many voters, is that there appears to be a double standard when manually counting votes. 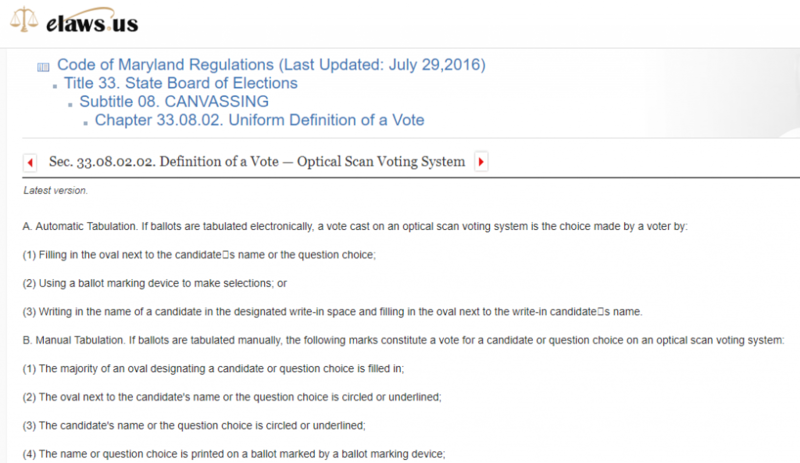 The proper way follows the instructions each voter receives–if the oval is not properly filled in, the instructions are not followed and the vote is rejected. That’s the law. How many ways can we manipulate the system by determining what constitutes a proper vote? Should we allow for a judgement call based upon “chicken scratching,” or should we tabulate votes based upon a scientific principle that follows the instructions to the letter? It depends upon who you ask, we suppose. What the hell happened to our system of a free and fair election, folks?